Remember When Zsa Zsa Gabor Slapped a Motorcycle Cop Across the Face? 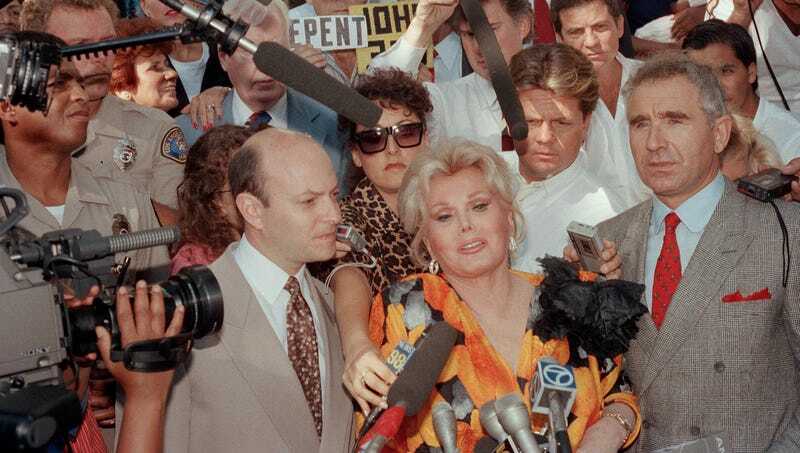 Were you aware that in 1989 Zsa Zsa Gabor was convicted of slapping a motorcycle cop right across the face during a traffic stop? TMZ didn’t invent celebrity shenanigans, people. The officer had been rude, crude and abusive, she said, finally dragging her out of the car, slapping handcuffs on her and plunking her down on the curb in the hot sun, her flowered skirt bunched indecorously up around her thighs: Zsa Zsa as Everywoman, manhandled by the law. By turns haughty and humorous, coarse and coquettish, weepy and willful, she was every inch the virtuoso ham of ‘’Hollywood Squares’’ (the television game show she appeared on), the shrewd, self-parodying glamour queen transported lock, stock and diamonds into a court of law. Please watch this amazing clip from the Phil Donahue Show, in which some random lady tries to come for Zsa Zsa and Zsa Zsa does not allow it.